Bernard “The Executioner” Hopkins’ historic IBF World Light-Heavyweight title defence against Karo Murat on Saturday 26th October from the Boardwalk Hall in Atlantic City will be LIVE and exclusive in the UK on the Channel Of Champions BoxNation (Sky Ch. 437/Virgin Ch. 546). In an incredible 25 year career, record-breaking Hopkins is the longest reigning middleweight champion in boxing history and became the oldest ever world champion when he won the WBC World Light-Heavyweight title against Jean Pascal in 2011. He then broke his own record when he beat Tavoris Cloud in March this year to win the IBF World Light-Heavyweight title. Now he aims to become the oldest fighter ever, at 48, to defend a world title if he beats the mandatory and number one ranked German challenger Murat who at 29 is almost twenty years younger than the American legend. Murat has only lost to Wales’ Nathan Cleverly in an Eliminator for the WBO World Light-Heavyweight title in September 2010, but has remained unbeaten since, recording two KO wins in his last three fights against Otis Griffin and Sandro Siproshvilli. 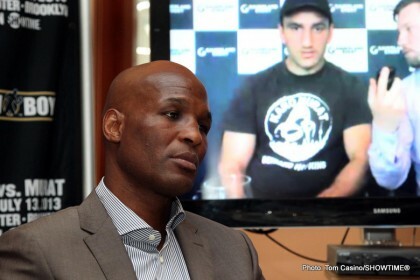 Hopkins was scheduled to meet Murat in July, but the fight was postponed when Murat had a visa issue. Also on the card will be the big-punching and unbeaten WBO World Middleweight Champion Peter Quillin making the second defence of his title against Gabriel Rosado. Hopkins v Murat features in an action-packed October on BoxNation that also includes Belfast super-bantamweight sensation Carl Frampton in an Eliminator for the IBF World title against Frenchman Jeremy Parodi on Saturday 19th October from the Odyssey Arena in Belfast.